Species extinction is common. Data supports the possibility that we are in the midst of the sixth mass extinction. While the larger statistics may be true, it can be hard to understand the process and the abruptness in many species because they are either too small, underwater, or otherwise hidden. 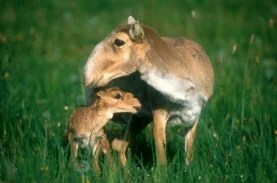 One species of antelope, the Saiga, is sadly demonstrating what extinction can look like and how it can act. After humans hunted them down to under 100,000 for medicinal purposes, they rebounded, and then dove again. As the herds shrunk, the impact of disease wiped out 70 % of the remaining animals. With so few animals, there were few herds; so, instead of impacting a few herds, the disease impacts the entire species. The deaths happened within two weeks, and unfortunately happened during calving season, further weakening the species. Because the cause hasn’t been identified, there’s the potential for the herds and the species to be hit even harder, resulting in extinction. While this is the story about one species, the key is the process and the fact that it can apply to any species – and that humans are a species. There is good evidence for the ‘sixth extinction’ hypothesis, and for the human role in it. Here in New Zealand there is ongoing conservation work. The Takahe has been brought back from the brink since its rediscovery in 1974 and there is ongoing work to save and maintain other species, including the iconic kiwi. But it’s challenging.